There is an African proverb that says, ‘He who learns, teaches’. Koos Mthimkulu, the humble winner of the 2011 Grain SA/Absa Developing Grain Producer of the Year award, did not enjoy school nor did he complete his schooling, but this has not prevented him from absorbing information and learning whatever he can from those who cross his path. And what he has learned, he shares not only with his farming partner, Clifford but also with other emerging farmers in the district. Born in the Paul Roux area as one of six children to a father and mother who both worked for the farm owners, his fate to become a farmer was sealed. Here he played with the farm children and when he was old enough he started doing various tasks on the farm – simple tasks like looking after the sheep and milking cows, but with each task he learned something which he could one day apply in his own farming enterprise. Later he moved on to the mechanical side of farming, driving tractors and using farm implements. After his decision to leave home to look for greener pastures, he was employed by Frikkie du Preez in the Senekal district. Koos mentions that this farmer played a very big role in his development as a farmer as he gained the most work experience on his farm. He recognised that Koos was eager to learn and started training him to repair tractors and farm implements as well as building new implements. As Du Preez did not believe in short-cuts he also learned a valuable lesson that you should do things the right way to save time. When livestock farming became Du Preez’s focus, Koos took over some of his equipment and started to do contract work for other farmers in the Senekal area. The money he earned was used to pay off this equipment. As his knowledge (and agricultural possessions) grew, he was later able to lease 55 hectares of arable land where he planted maize. He was offered the 524 hectares farm Astoria in the Senekal district in 2007 by the Department of Land Affairs. Here the father and son team now cultivate maize and sunflowers and also farm with Bonsmara cattle and Merino sheep. Koos and wife Lydia have two daughters, Irene and Petunia, and a son, Clifford, who are all married. Clifford, who completed a two year course in marketing management and agriculture joined his father in 2009 and loves the cattle side of the farming. He also sees to the maintenance of the mechanical equipment. Koos on the other hand is a keen crop producer, but the drought of the past season prevented him from planting maize this season, so only sunflower was planted and some sorghum and oats for fodder. Fortunately, another valuable lesson he learned was that in agriculture one should not put all your eggs in one basket. The expansion on the livestock side of his farming enterprise has proved helpful in difficult times. In a good season they plant 150 ha of maize with an average yield of 3,5 t/ha and 350 ha of sunflower with an average yield of 1,5 t/ha. Clifford has great admiration for his father and says the biggest lesson he has learned from his dad is that you must learn to do things yourself and not depend on others to do everything for you. He is very proud of his dad and hopes to follow in his footsteps and perhaps even one day receive an award himself. Koos mentions that he will be forever grateful to Grain SA and the Department of Land Affairs for their support and input in his farming career. He has gained a bucket full of skills, training and knowledge from the Senekal Study Group of the Grain SA Farmer Development programme. Johan Kriel, his mentor also plays a big role in ensuring that his production practises are on track. The award he received in 2011 came as a big surprise, but he knows that it made him a more confident farmer. Love what you do – be passionate about farming. Farming is easy when you love it. If you work hard, you will make money, but work comes first. Be a hands-on, on the land farmer. You have to know what is happening on your land. Be involved and do the work. Learn all you can from those with experience. Another proverb, ‘If you want to go fast, go alone. If you want to go far, go together,’ describes this father and son team. Each one knows where his strength lies. They learn from each other and aren’t afraid to share what they have learned with those who cross their paths. For the future Koos and Clifford hope to invest in more land to become commercial farmers and contribute to food security in a bigger way. This is a team with a bright future ahead. 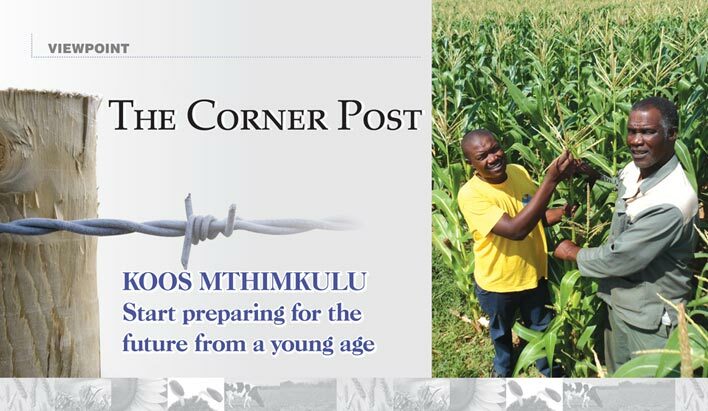 This month's edition of The Corner Post was written by Louise Kunz, Pula Imvula contributor.